Tabla maestro Ustad Zakir Hussain says, "I was considered for the role of the young Dilip Kumar. But the role was eventually played by Jalal Agha." It took 16 years for the movie to be complete. The first full feature-length movie to be revived/colorized for a theatrical re-release in the history of world cinema. It has been done for some Hollywood movies but only for re-release on home video. Prithviraj Kapoor would look into a mirror as tall as himself before each shot. When K. Asif asked him why he did so, he replied, "I do so to get under the skin of the character." With the advent of Jhansi Ki Rani in 1951, colour films became a revolution. K. Asif wanted to remake the whole film in colour, but when the distributors lost patience settled for having two songs and the film's 30-minute climax shot in Technicolor, with the rest of the film (85%) black-and-white. However, in November 2004, the whole movie was restored and colorized in a year-long process by the IAAA (Indian Academy of Arts and Animation) and re-released. This was one of only two films K. Asif completed. When he died in 1971, he left behind two unfinished films, Sasta Khoon Mahenga Paani and Love and God, the latter released by K.C. Bokadia in 1986. This was (counting Sanjay Leela Bhansali's Devdas) the most expensive film ever made in Indian history. Tailors were brought from Delhi to stitch the costumes, specialists from Surat-Khambayat were employed for the embroidery, Hyderabad goldsmiths made the jewellery, Kohalpur craftsmen designed the crowns, Rajasthan ironsmiths crafted the weapons, and the elaborate footwear was ordered from Agra. For the battle sequence, 2000 camels, 4000 horses and 8000 troops were used, many of them soldiers on loan from the Indian Army. Altogether the film cost Rs. 1.5 crores (38.29 crores in present terms). For the battle sequence, 2, 000 camels, 4, 000 horses and 8, 000 troops were used, many of them soldiers on loan from the Indian Army. This was arranged through special permission through the Indian Ministry of Defence-a rare occurrence today. The soldiers came from the Jaipur regiment of the Indian army. The statue of Lord Krishna used in the film was made of pure gold. The heavy chains Madhubala wore in the film were authentic, not the lightweight models worn in those days. It was her greatest ordeal in the film and she was bedridden for days, nursing the bruises caused by wearing those chains. The movie was originally shot three times, once each for lips moving for Hindi, Tamil and English dialogs. The Tamil version of the movie did very poorly, so the dream of having Shakespearean actors from Britain doing the dubbing in English was dropped. In 2004, it was announced that after extensive search, no copies of the English version are available. Before principal photography began in 1953, Suraiya was offered the coveted role of Anarkali. 20-year-old Madhubala, who longed for a significant role, won the part. During Making Of the Film K.Asif was in huge debt so he even bought paan and cigarettes on credit. 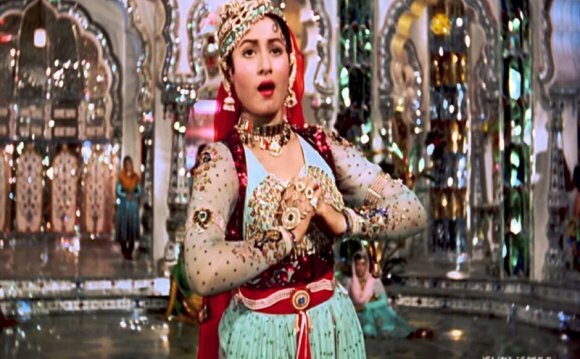 'Mughal-e-Azam' (1957) was a trilingual - with all scenes shot thrice in Hindi, Tamil and English. When the Tamil one flopped miserably, the English language one was aborted. When the first shooting schedule began in 1946, K. Asif cast Chandra Mohan, D.K. Sapru, and Nargis for the roles of Akbar, Salim and Anarkali, respectively.